If you have a convertable Corvette, this is for you !! Our Angelwings C5C6 Track Day Bar for 5th and 6th generation Corvette convertibles is now available! It is STRICTLY for Track Day and HPDE use, with welded 1.5″, 0.12″ wall DOM steel construction. It is a true bolt-in, with only minimal plastic trimming and no welding required. And unlike the other products out there, it will look so good that you’ll want to leave it in your Corvette when you’re on the street. In fact, if you’re not into speed events, you may want one just for the agressive styling touch it will add to your Vette! 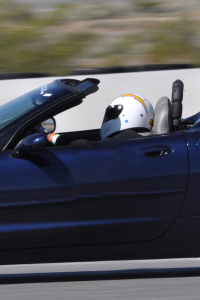 The Angelwings C5C6 Track Day Bar does not interfere with operation of the soft top. The Angelwings C5C6 Track Day Bar comes standard in a satin black powder coat finish. For and additional $100, you can order it in gloss black, bright red, yellow, white, grey or blue powder coat. Or for $200 more, we’ll match or create a custom powder coat color for you. As with all Angelwings Tech products, the Angelwings C5C6 Track Day Bar is proudly made with quality materials, here in the USA! Because the Angelwings C5C6 Track Day Bar installs behind both the driver and passenger seats, there is a loss of seat travel. So if you are 6 feet or taller, it probably will not work for you. If you are 5'-10" or taller, it may be tight, depending upon your proportions and driving position. Angel Pads are a great “bang-for-your-buck” way to reduce your lap times! One big problem with most sports cars, sports coupes and other vehicles designed for the street is that the seats are made for comfort and ease of access. That may be fine for day-to-day driving, but for anything more spirited, the seats just don’t cut it. Angel Pads are made of heavy duty Caldura material with dense Q70 foam inserts. They have zippers sewn in so that the foam may be removed, rinsed and air-dried. The durable Caldura material can be machine or hand-washed. Angel Pads fit in almost all cars and trucks. No cutting or special tools are required and they do not interfere with seatbelt operation. Angel Pads come standard in black. Custom colors and patterns are available at extra cost. Angel Pads are proudly made with quality materials here in the U.S.A.!